My little brother stopped by my house today to take me out to lunch. He paid. What an awesome guy, taking his big sister out to lunch! Yes, he is single. While we were at the park getting two for $1 tacos (happens every Wednesday!) we saw some of his friends. After conversing for a while, Keith decided he was too tired to stand anymore. He collapsed on the sidewalk next to an IBC Rootbeer bottle. It was too classic. He looked just like a little hobo. we have intruders in our home. I thought they were just harmless spiders so I left them alone. Spiders are good. They rid our home of horrible little bugs. Then I got a flyer in the mail. It was from a pesticide company. They had a picture of a hobo spider, and a picture of a hobo spider bite. It was then that the suspicions began. Our little buggy friends could possibly be bad. 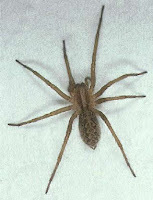 I looked up some info last night, thinking we really only had the grass spider. And then I learned. We have hobos. Here is the question. Would it be better to spray now while I am pregnant, or after the baby is born? Keith is really good at pointing and yelling "BUG! BUG!" and not touching. I would be heartbroken if he ever got bit. I will continue to encourage his fear of bugs until we have this problem taken care of. He sure takes after his mother. I do the same yelling and pointing thing with Jeffrey. "ANT! ANT!" and he comes running and gets rid of it for me. What a great system we have going. CALL NOW! Go to that one phone you have in the back of your house, and CALL THE BUG DUDE! I am adding both of your buttons to my site. I'll be back here often. Oh, those hobos are nasty. They can get pretty aggressive. I would get rid of them. We should get together sometime soon. Maybe do some maternity pics or something. It must be that spider time of year, I see a lot here as well! We even had a scorpion. Needless to say, I'm not paranoid of all bugs taking over or crawling on me at night. But anyway, I have read that pesticides are really bad to be around when pregnant or with young children. So you might either want to hold off or have it done when you can be gone for a few days. ewwww no hobos!! you should totally call!! I think it would be better if you get rid of the bug!!! And btw I had visited ur blog once and then I forgot it's name and I have been wondering who's blog it was..Now I am gonna follow it! You could have him spray outside, then use those spider traps inside? That's what my mom does so she doesn't have to inhale it inside the house. I'm sure people who've actually been pregnant before will have a better answer than I do! FYI, there arent really any 'gross bugs' in UT. Try living in the south where there are bugs EVERYWHERE!! !And i still kill the spiders. Thank you Amy for the lemon scented Pledge trick, I will try it for sure! We have the same intruders. I hate spinders too! I'd call now too. Better to deal with it now, than after the baby is born and you're too tired to call the bug man! Then you can rest easy once the little one is born!